Many of the 2000 patients who have visited IMAN’s Free Community Health Clinic in 2015 have come in sick and often very tired. Though the most recent Affordable Care Act victory continues to protect the health care subsidies of millions of Americans, millions more remain outside of that safety net. So many still lack access to quality, culturally competent health care, and are still sick and tired of dealing with the vast array of health issues prevalent in working-class communities of color like IMAN’s. In 2015, our patients have come from almost every zip code in the city. Whether they were seeking b asic primary care or behavioral health counseling, IMAN doctors, nurses, volunteers and staff continue to do everything in their power to treat these individuals with the compassion and dignity they deserve. 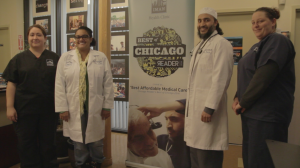 In the year since IMAN’s Health Clinic was designated “Best Affordable Health Care” in Chicago Reader’s “Best Of” series, it has continued to grow and expand. Not only have our hours and services increased, but also has our progress towards the larger vision of becoming a Federally Qualified Health Center, with even more resources and opportunities available for all of our patients. One day soon, God willing, IMAN’s clinic will be significantly sustained via the resources generated through a federally reimbursed billing process. For now, though, this clinic and its thousands of patients across the Chicagoland area rely on YOU. Please make your tax-deductible and zakat-eligible donation to IMAN’s 2015 Ramadan Drive today to help sustain and grow these vital, life-giving services in this sacred month. Last year, a San Francisco news station reported on a CDC study chronicling the disproportionate levels of Post-Traumatic Stress Disorder (PTSD—usually associated with war veterans) among mostly black and brown youth living in the inner-city. In the segment, the reporter quoted someone who called the condition “Hood Disease,” and the offensive term went viral. If there were a disease connected to this social reality, it should have been one calling out years of our collective silence and indifference. This inaction amounts to our complicity in the structural and systemic factors that have led to epidemic levels of violence in neighborhoods around the country, like the one IMAN works in. Failing schools, lack of meaningful employment, an eviscerated safety net and a host of conditions that criminalize and further marginalize youth of color make violence all but inevitable in certain zip codes. Ramadan is a time for us to honestly examine our spiritual and social realities, and to actually work towards a greater healing. Through its free behavioral health services, youth programs, corner store intervention work, housing rehabilitation and weekly farmers’ market, IMAN is attempting to do its part to contribute to this collective healing process. Please pray for our work during this special month and help us to reach and exceed our 2015 Ramadan Drive Goal with your generous zakat-eligible, tax-deductible donation. We can’t do this work without your support. May the Most High envelop us all in the spirit of Mercy and Healing this Ramadan! Ramadan at IMAN: Don’t Miss These Exciting Events! As we enter the month of Ramadan, IMAN staff and leaders will be attempting to reap the rewards of this blessed month by deepening and intensifying our engagement with each of our programs and initiatives. We have an ambitious fundraising goal that we must meet in order to sustain and advance this work, but, as usual, we are trying to keep staff focused on the work and not on fundraising. In order to do this, we will be relying on you to help us reach and exceed our $400,000 goal. Ramadan Reflections: This series of interactive classes and discussions on the spiritual and social dimensions of this blessed month is a favorite among IMAN leaders and supporters. Ramadan Reflections is held on Wednesday evenings from 6:30 pm to 8:15 pm, and each class will be followed immediately by a healthy iftar dinner at sunset and the opportunity to join or observe the late evening taraweeh prayers. Ramadan Refresh the ‘Hood Challenge: This special health and wellness campaign returns for the 4th consecutive year as IMAN collaborates once again with our friends at the M.U.R.A.L. Foundation (formerly the Lupe Fiasco Foundation). On Tuesdays and Thursdays from 4:00 to 6:00 pm, we’ll be delivering subsidized fresh produce to our Muslim Run corner stores while engaging residents and customers outside the stores with free fruit smoothies and health information. Fresh Beats & Eats Farmers’ Market: Join us at IMAN each Sunday from 10:00 am to 2:00 pm for fresh produce, homemade desserts, artisan crafts, fair trade items and for some healthy treats to break your fast! Jum’ah with Usama Canon: Join us during one of the final Fridays in Ramadan for some spiritual nourishment from Ta’leef Collective’s Usama Canon. Friday, July 10th at 1:00pm. Please visit IMAN’s website, follow us on Twitter and connect with us on Facebook to follow our progress with the Ramadan Drive and for the latest on all of our Ramadan activities. 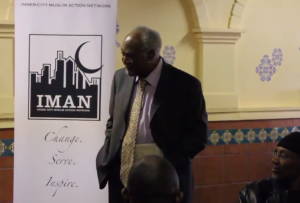 Recently, Congressman Danny Davis visited IMAN for the first time. I have known Congressman Davis for over 20 years and he is a compassionate and long-standing national advocate for community health centers and the formerly incarcerated. I came to IMAN’s Board of Directors, while leading Kennedy-King College in Englewood, because I see the need for IMAN’s work. As co-chair of the Board, I, like Congressman Davis, see in it the power to transform individuals and uplift communities. I urge you to helpIMAN expand and deepen those efforts, allowing us to be that Prophetically inspired “sermon walking”. Please help us reach our 2015 Ramadan Drive goal by encouraging friends, family and colleagues to make a tax-deductible, zakat-eligible donation to IMAN. Have a blessed and beautiful month.